Big Tree Company - Recreational Tree Climbing! 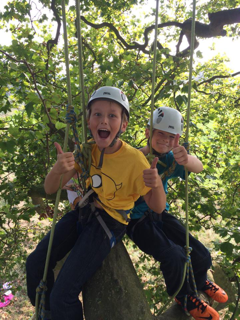 We are the largest provider of recreational tree climbing in the country and we work with many schools, National Trust venues, festivals, private venues and clients all across the UK to provide an adventure which encourages safe risk taking on a realistic budget. We pride ourselves on offering a first class service and we have built a strong reputation through the development of rigorous health and safety procedures. So why is tree climbing so popular? It’s a thrill, an adrenaline rush and we all need adventure. It builds confidence by taking you out of your comfort zone and encouraging you to challenge yourself. Tree climbing is achievable and exciting and take place in beautiful locations. Tree climbing brings you closer to nature, it can help to relieve stress and leaves you with a huge sense of achievement. Tree climbers support and encourage one another building team work as they trust and rely on each other, testing balance and co-ordination. Eight people can tree climb together supported by a fully qualified instructors. Tree climbers can learn new skills learning how to use the ropes. We offer a fun and safe way to enjoy woods from a new perspective. You’ll be closer to the trees in all their glory and to the insects, birds and other animals that live in them. Have a bird’s eye view of the woodland floor as you look down through the leaf canopy and see what the squirrels see.